I purchased a meal deal from Groupon for Jasmin 1. I've gone past it on the train so many time and have always been curious. 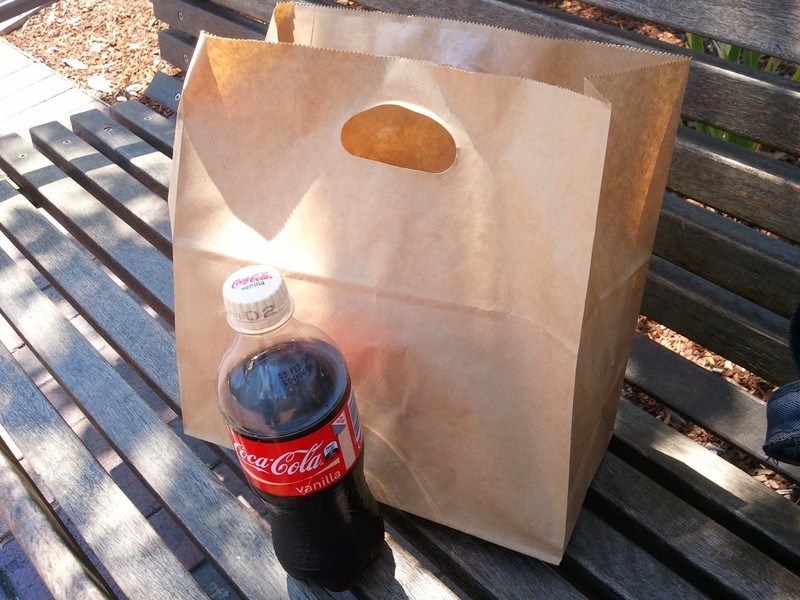 I was blown away by the generous reviews on Urbanspoon and decided to give this meal deal a go. 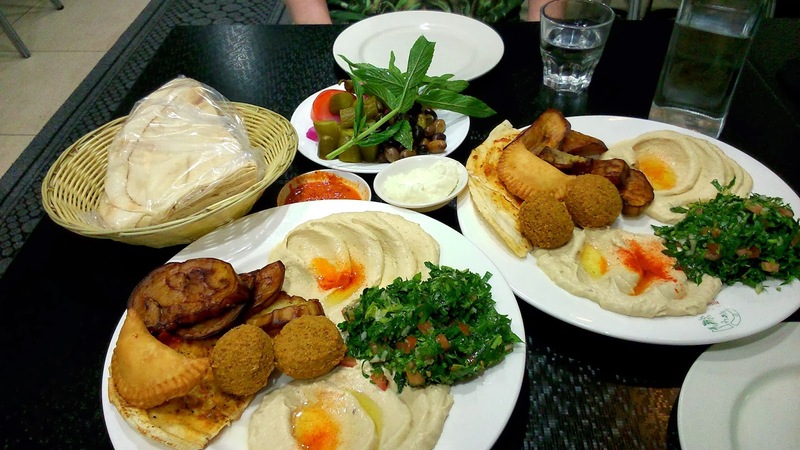 I prepared myself for some true, authentic Lebanese food! The deal was approximately $23. 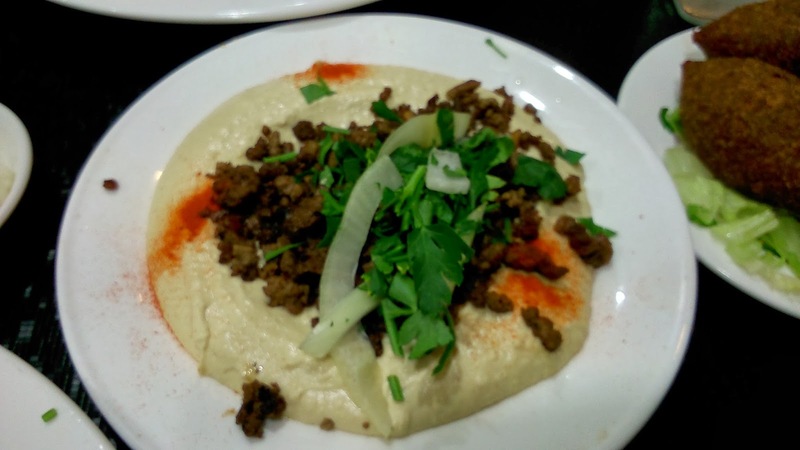 The staff were friendly, the interior was quite nice and spacious... but most importantly, food came out quickly with generous portions. We both got a vegetarian plate each. The sauce, pickle and bread were complimentary. 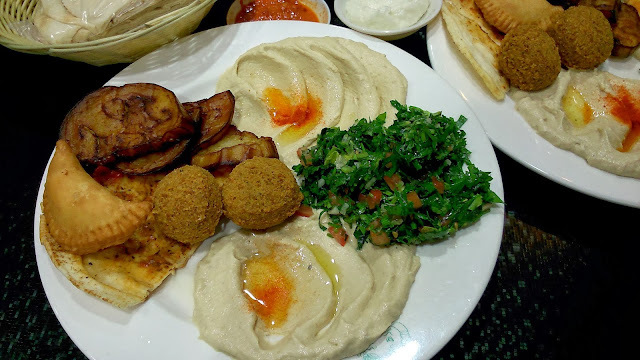 Vegetarian Plate: Deep fried egg plant, Cheese sambusak (the pastry/turn over thing, it had cheese inside), falafel hommous, Baba Gannouj (mash egg plant dip), tabouli and herbed bread. 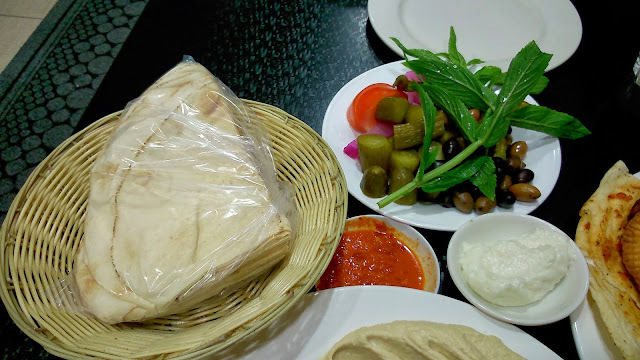 Lebanese bread, pickle, tomatoes and olives. Chili dip and garlic dip. So the aim is to make your own mini wrap with all the fillings (eggplant, falafel etc) from your mixed plate dips etc included with pickles. The following two sides came a bit later on. 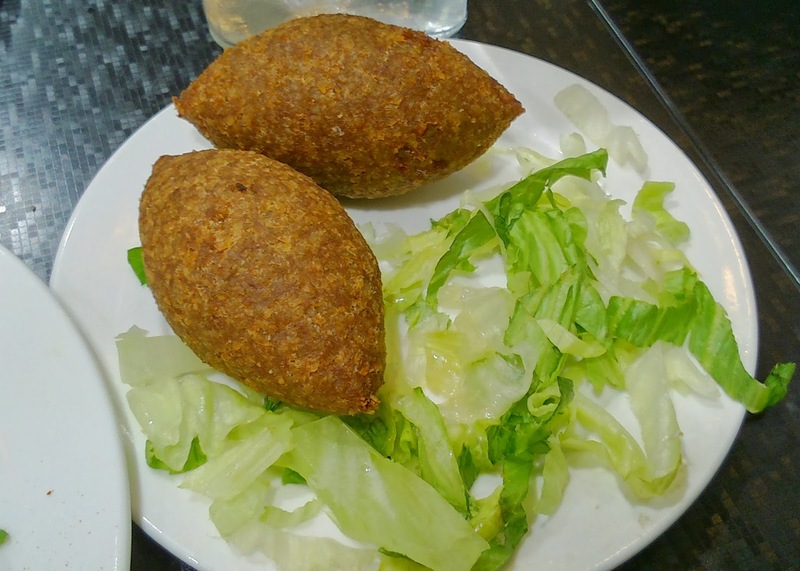 This might have been Meat Samboosik - a deep fried doughy outer with minced lamb in the inside. Full table...... for two! we had more than enough, so much we had to ask for 2 takeaway boxes! 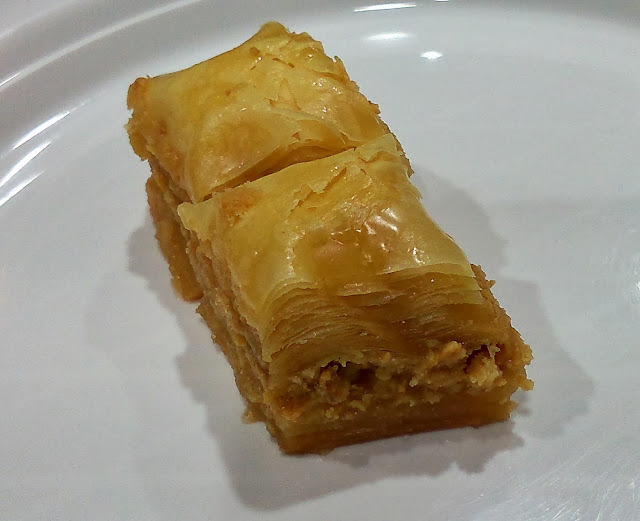 And of course Baklava for desert! This was probably one of the best voucher I have ever purchased!! I'd say give Jasmin 1 a go, you'd be stunned by the quality. 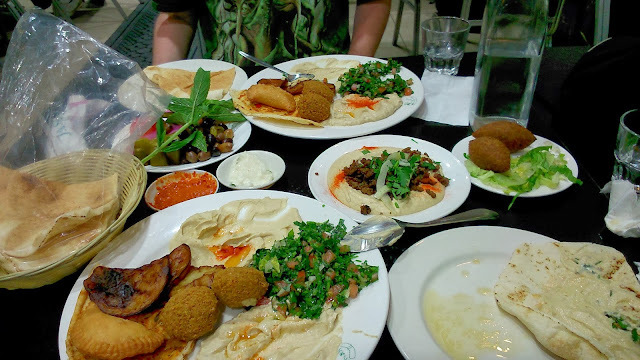 I've seen countless pseudo-lebanese restaurants around selling small portions of unauthentic over priced platters. Jasmin 1 is worth the travel! 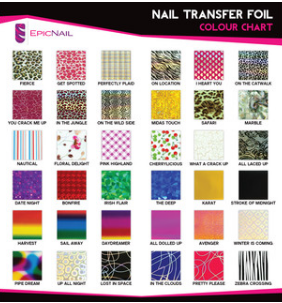 Epic Nail emailed me and asked if I would like to try and review their nail foil - I was extremely curious, I've never heard of nail foils before. I browsed through their site (ended up being on the web page for most the morning - I got caught browsing through their huge range of nail products!!!). 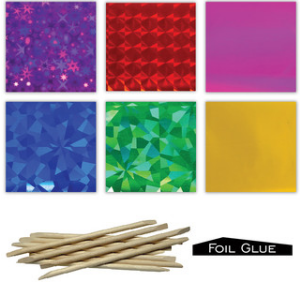 There were three different nail foil kits - $36.99 per kit (6 designs each foil is 4cm x 100cm, cuticle sticks and nail glue. You can do up to 60 manicures with each kit. If you want ALL the designs + more... there's an Ultimate kit!! I picked Essential because I like the lace patterns. This post is a little over due, but I wanted to be really detailed! 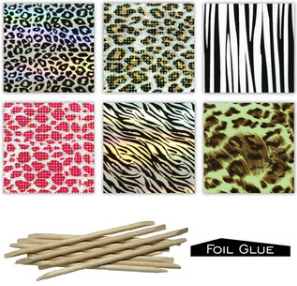 Here's the cuticle stick, I use the pointy end to pick out unwanted foils. 5. rub the surface (you should be able to see the foil sticking to your nail) peel off gently. I thought this was absolutely gorgeous, but once I applied it on my nail, I as convinced. It's was really down to personal preference, I don't think pretty pearly white goes too well with olive skin. I painted a coat of red polish and applied the foil on top. You can either apply the foils on by stamping or full application. Since this was such a colourful design I thought I might ruffle it up a little by dabbing the foil onto my nails, I was a little hesitant about applying this particular design because it was so colourful! I couldn't believe how much I loved the colours once I applied it. I think this is my new favourite! Although, I'd probably suggest to apply your nail polish prior to application, not sure how I feel about my dabbed look. My parents hate like the smell of nail polish inside the house, so I usually do my nails in the garden on a sunny day. It hasn't been particularly sunny lately and I've been pretty busy during the day so i haven't really been able to paint my nails. My nails are often neglected because of this. I was amazed that the foil didn't have any scent, I was able to do my nails while watching tv and not have my parents complain!!! It was really quick and easy to apply, I didn't have to wait for 5-10mins as I would after applying nail polish. I get very impatient and start doing things with my fingers to ruin the newly applied polish. The gorgeous designs were definitely a huge plus, probably a good idea to keep a few designs in your draw for special occasions! I've had quite a few people commenting on how much they loved my nails with the foils. This is great for people who like to change their nail design every couple of days. Some of the foils are really easy to apply, some were a little stubborn. Quite often, the edge of my nails may not transfer as smoothly, but once you apply a coat of nail polish as the base, it's not so obvious. Unless you have time to fix up the edges by re-stamping, it would probably worth to paint your nails first. The only other con I can think of is that it doesn't last as long. Make sure you apply a generous top coat, that'll prolong the life a little. My top coat was a little flimsy so It started to chip after a couple of days. 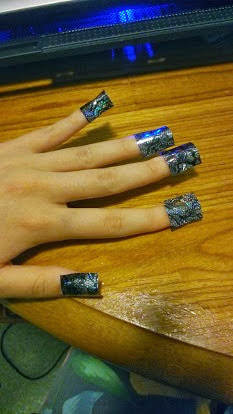 However, the one roll of foil will last you for quite a few applications (especially if you have small nails like me). 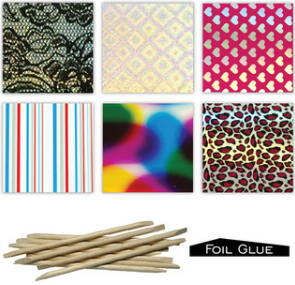 Have you tried nail foils before? Which design is your favourite? It's almost christmas! I've been trying to gather little bits and pieces I can put in my traveling kit.. super excited to receive a box full of goodies (literally box full). I only do my brows when I over pluck, I have a lot of eye brow lol. This is a nice dark brown colour that would be useful when I over pluck. Otherwise I'll give it to my mum. She needs more brows. WOOHOO! I've seen this floating around previous boxes. Apparently the mask will fade wrinkles and regenerate damaged cells. Never tried Aveda but heard many many good things about this brand. I gave some hair samples to my bf and he loved it. Looking forward to try these! Dying to try this mascara, very happy to receive it! yay! I was really excited to see this, I've been curious to try their boxes out.... so I jumped onto their website... and it's a little outside of my price range... $64 for 3 meals....... even $34 for 3 meals is a bit too much. I've made a week's worth of tuna pesto pasta for under $10. I think i'll stick with home cooking and doing my own shopping for now. A very full box this month, not too bad. Although, a few products I wouldn't use or would pass onto family members. Perhaps, LHI can look into personalising profiles in the near future? Lord of the Fries (LOTF) kindly invited me back to their store. 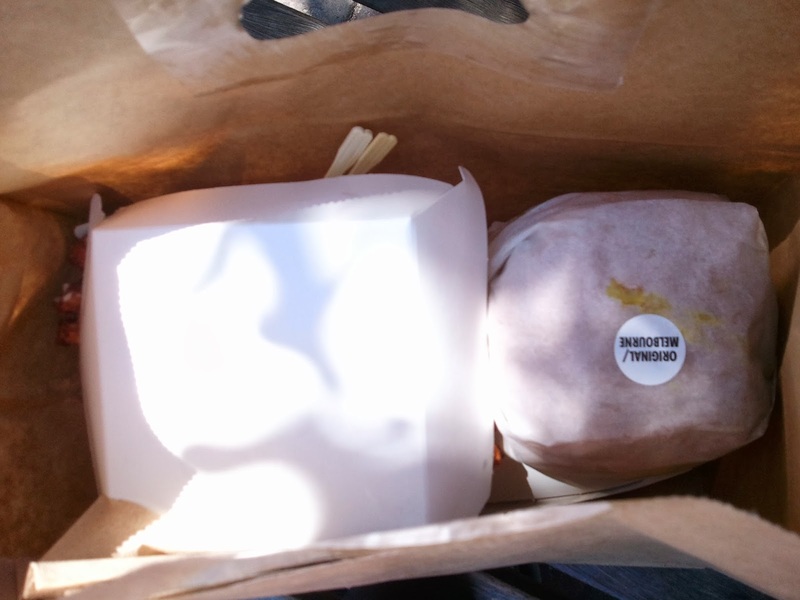 They provided me with a free meal deal of my choice (burger, chips and a drink) RRP $14.95. I was hesitant and didn't quite know what to expect in terms of development and progress. Lets run through this before we start... LOTF is 100% Vegan, vegetarian and halal. I wasn't too impressed the last time I went to LOTF (see review here), I was keen to see some improvements. I'll put up some before and after pics. We got the original burger(again) - seems to be the best choice. I was quite surprised by the improvement. I can actually see the cheese, sauce, patty and lettuce. This actually tasted good, lots of flavour from the sauce. Much better from the mush I had the first time round. My bf tried LOTF in Melbourne, he said this burger tastes more like it, however, there is still room for improvement. I really like the vegan concept, however there is a larger market out there. 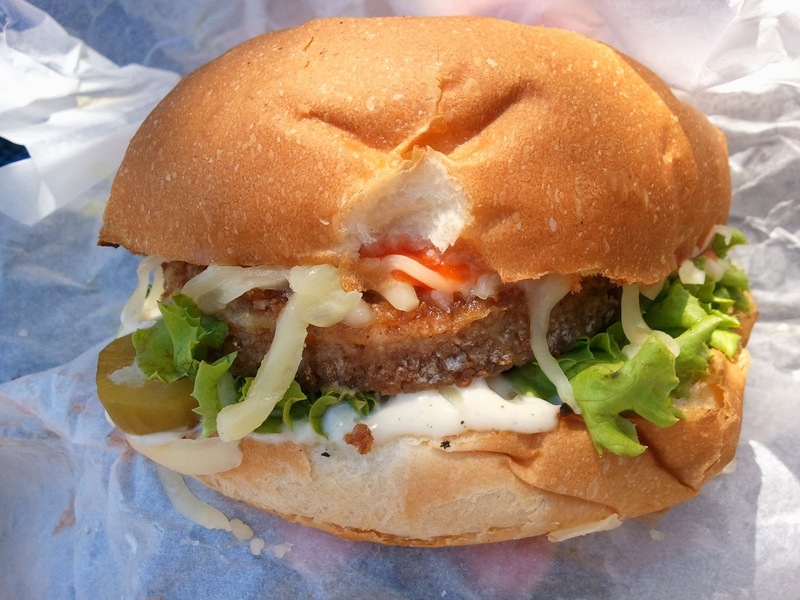 We eat with our eyes as we unwrap the burger, then with our taste buds. This burger may have satisfied my papillae, but us meat eaters love big scrumptious burgers... now, why should I go to LOTF instead of Hungry Jacks since I'd be paying roughly the same? I guess the next step is to rake in the carnivores. You had the choice between potato and sweet potato. 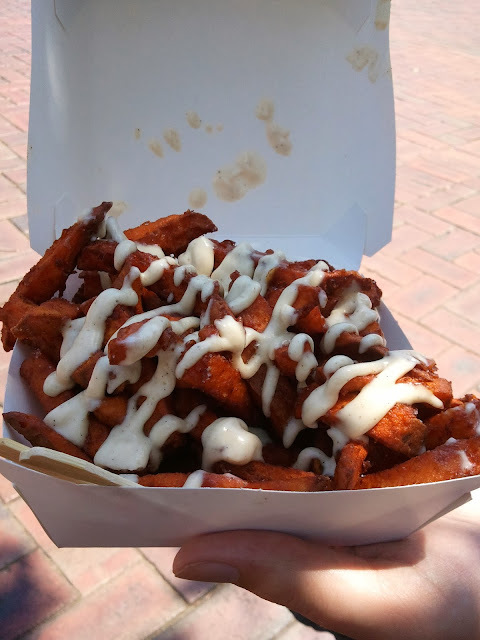 Euro sauce is pretty aioli. This was crunchy and went really well with the euro sauce (recommended by LOTF staff). I'd come back for this. Highly recommended. This was on sale for $5, it was initially $7.95, I thought it was a good buy. I can't say I like this too much, probably just due to personal preference. 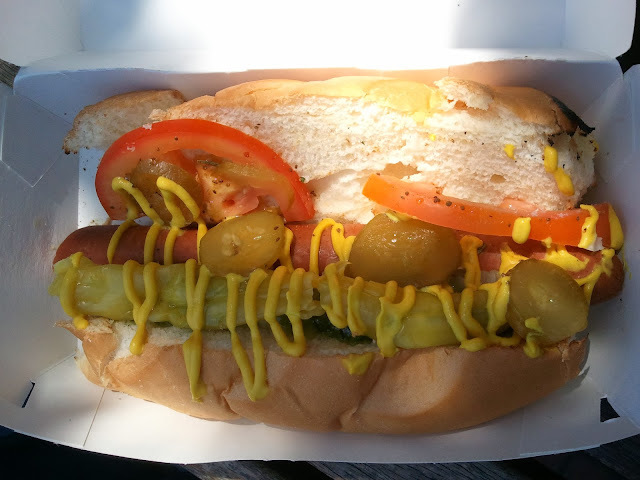 The hot dog itself tasted like soy substitute to me. Maybe add some onions? Great service overall, very quick and friendly. Very bubbly staff! Cudos. Here's some before and after pics. I'm glad to see LOTF taking their customers feedback into consideration and improved their food. LOTF is still new, I hope to see continuous development down the track. Have you been to LOTF? What do you guys think about the before/after?